After a joyous walk along the River Lea this afternoon, I finally got to see Olympic Park at close range, rather than merely on television as a backdrop for the evening news during the summer months. 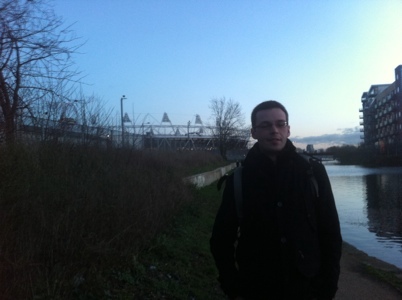 2012 was of course the year of the London Olympics, so in a sense I was arriving in this corner of East London a year late. Nevertheless it was still fascinating to see up close the awe-inspiring architecture of the main stadium and the neighbouring tall red sculpture, the ArcelorMittal Orbit observation tower. That said, I had expected all buildings close by to be gleaming, new constructions. Not so. Here, in the streets just a stone’s throw from Olympic Park, you find evidence of industry that’s continuing – from factories and warehouses to transport depots and scrap dealers. There is clearly more regeneration to come. But there is the argument that, if businesses are still trading then why pull down the buildings they use for their operations? – even if from the outside they do look a bit tatty. Standing in this unique spot in Britain seemed a fitting place to reflect on 2012 – and the dreams that were made for athletes and the public as a whole. Many will recognise, for example, that London became a much more happy place when the Games were on, as I wrote about in the summer. In 2013 we of course don’t have Olympics to look forward to and many people will continue to struggle through the effects of the recession, but I believe there are still reasons to be optimistic and cheerful. We have in Britain a unique history and historical buildings that continues to have an enormous impact on our lives. This, of course, is the very essence of Past In The Present, and we very much look forward to having you a long as a reader, sharing this journey with us.